A child born today will be drawing her pension before she is equally represented in the Westminster parliament – or has an equal chance of being elected to it. In 2018 we celebrated 100 years of the vote for women. We’ve come some way since then, but we’re nowhere close to parity. Wales became the first nation in the world to achieve 50:50 representation in its national legislature in 2003. 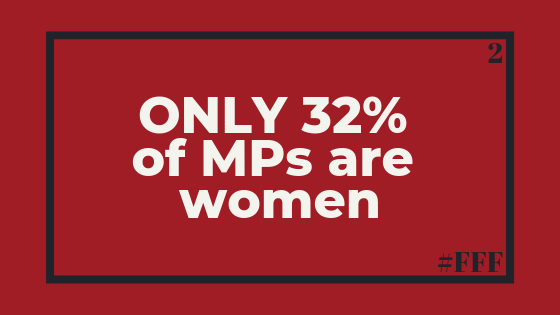 Women are 51% of the UK population but only 32% of the House of Commons. There are 650 members of parliament and only 208 of them are women. In Week 1 of Feminist Fact Friday I highlighted one of the toughest facts from the World Economic Forum stating that at the current rate it would take us 107 years to close the gap on political inequality globally. I can think of no adequate reason why we should need to wait that long. In 2018 women remain underrepresented in all levels of UK politics and we lag behind other countries, the UK’s position in the global rankings having fallen over the past 20 years from 25th in the world in 1999, to 41st now. The proportion of women in local government appears stuck at around 32 per cent across all of the UK nations. In my first post I noted that research shows that women are more likely than men to advocate on ‘women’s issues’. That’s not me saying that women’s issues are more important than men’s, but with women making up only 32% of MPs it’s safe to suggest that we’re missing out on a lot of advocacy on women’s behalf. Women pay more for the same things, just because they’re women. Sometimes those things are pink. Maybe the ink is just more expensive. Women are disproportionately negatively affected by inequality (though men are badly affected by gender inequality too) and women are more likely to advocate for ‘women’s issues’. So let’s try a 50:50 Parliament and see where we get to. Preferably before 2067 please. If you know (or are) an amazing woman who can help us to get to gender equality in Parliament, then jump on board the 50:50 movement. Men currently outnumber women 2:1 in Parliament but by nominating and encouraging someone you know to enter politics you could make a huge difference #AskHerToStand #SignUpToStand. For women in the States, something like She Should Run is an option. Use ‘shine theory‘ to amplify the achievements of women politicians and those doing good in the public eye. Keep an eye out for when coverage strays into talking about women in a gossipy fashion or just blabbing on about how they look or how they’re dressed. Check yourself for that kind of crap and amplify the positive influence they’re having instead. Show the media what kind of coverage sells. You might not be keen on being in the public eye yourself, but there’s a hell of a lot you can do to support those who are taking one for the team. It might be too soon for you (or another amazing woman you know) to get into politics but that doesn’t mean you can’t start laying the groundwork. Something like working on your public speaking and presentation skills can only work in your favour and if it’s something you can use for a future in politics then so much the better! Feminist Fact Friday is a passion project to educate myself (and anyone else who might be interested) in key facts that prove just how unequal our society remains, in an effort skip a decade or ten of the 107 years it’s going to take women to reach political equality around the world. You can read more about this project in my Intro. ** The Femicide Census was created in partnership with/supported by Karen Ingala Smith, Women’s Aid, Freshfields Bruckhaus Deringer LLP and Deloitte LLP. This uses data from 2017.